Rio de Janeiro, Mar 3 (EFE).- Search and rescue teams have recovered the body of the last of nine people killed in a Feb. 11 explosion on an offshore platform leased by Brazilian state-controlled oil company Petrobras, the owner of the rig said Tuesday. The badly decomposed body was found Monday in a compartment teams had been unable to reach because it was flooded, according to the Norwegian company BM Offshore, which also operates the platform for Petrobras. The explosion occurred in the engine room of the FPSO Cidade de Sao Mateus rig, anchored in the Atlantic Ocean some 120 kilometers (75 miles) off the coast of Espiritu Santo state. Seventy-four workers were aboard at the time of the blast. Five bodies were recovered within hours of the explosion and four people were declared missing. Thirty-three people were injured and two of them remain hospitalized. 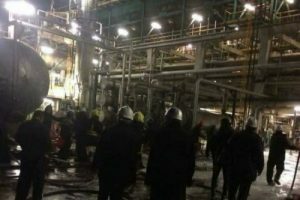 Since the blast, operations have been suspended in the platform that was extracting 2.2 million cubic meters (77 million cubic feet) of natural gas per day. Brazil’s oil regulator, the ANP, said the explosion did not cause spills or leaks of hydrocarbons and that the platform has been stabilized, though it has not been authorized to return to operation.